I like to think I’m fairly on the ball. I pay attention to what’s happening, and that includes transport issues. So I was a bit surprised to learn only this morning that Govia Thameslink Railway (GTR), the operator of my local trainline, is busy trying to close pretty much all the station ticket offices on the line. Instead, everyone will have to use self-service ticket machines for everything, and they’ll have someone wandering around to either help you, or sell you a ticket from a handheld machine. How they will cope, on their own, late at night (the proposals say they’ll be present from first until last train) isn’t clear. There has been a minimum duration consultation that is closing this Sunday. I only learnt of it because a member of the RMT was handing out postcards at my station this morning. And if there has been a poster up in the station promoting the consultation, I’ve not seen it. I suspect that majority of rail travellers from my station – and probably many others on the line – hadn’t realised this is being proposed, and still don’t. Of course London Underground has now closed all the ticket offices on the network with the exception of 6 visitor centres at major stations like Victoria and King’s Cross (well, it’s in St Pancras actually). Instead commuters, tourists and visitors have to use machines to learn the delights of the Oyster Card system. Or you can use your contactless card – assuming you have one, and if you’re an overseas visitor, don’t mind paying a very healthy transaction fee on every trip. But at least the London Underground is relatively simple. You can only buy tickets to other underground stations, and they all lie in zones, meaning that the ticketing costs are relatively simple (I say “relatively”, but explaining about off-peak, peak and daily caps is fiddly). And the closure was planned over many months. There wasn’t a quiet 3 week consultation with a desire to get the whole thing finished within months regardless of readiness. So what’s the problem with this then? At 45 stations, the ticket offices will close entirely, and they’ll have a “station host” standing around by the gates helping people use machines. That’s not a “change” to “office opening hours” it’s an end to opening hours. The “amendments” at the other 39 stations will see those ticket offices closed at all times except between 0600 and 1030 on Mondays to Fridays. Fancy a trip to London at the weekend? Going to the football? You’ll have to make do without unless you join the massed ranks in the morning commute and buy your tickets then. Or you’ll have to use a ticket machine. Some machines don’t even let you buy a ticket starting at another location. Especially frustrating if you’re using your season ticket for part of the journey. * Few people seem to know about these, but if you have a Travelcard for, say, Zones 1-5, then you can buy a ticket from the boundary of your zone onwards. This saves money if, you’re perhaps travelling across London and on to another destination beyond your zone on the other side. You effectively don’t have to double pay for the part of the trip you already have a season ticket for. And that’s before making use of the booking office staff who can often alert you to discounted tickets that you may not have known about – group travel deals for example. To do many of these things, you can’t complete purchases online either. You may be able to buy a season ticket in advance, but you have to await delivery, be available when it arrives and so on. It’s an enormous inconvenience in comparison to going to your local station. If you don’t have access to the internet – perhaps because you’re elderly, or poor (i.e the most disadvantaged in society), you will be forced to make an extra trip to the closest station that will actually sell you tickets, at additional cost! Londoners have proportionately fewer cars than the rest of the population, and therefore need full access to public transport. Closing station ticket offices undoubtedly curtails this. Under these proposals, from Letchworth Garden City to Harringey along the line I use daily, there will be no station ticket offices open at all, with the exceptions of Hertford North, Stevenage, Hitchin and Letchworth during early peak Mon-Fri – all stations far to the north of where I live. To buy any ticket that is not available via the ticket machine will involve a trip to Finsbury Park or more realistically (since the ticket office there is tiny), King’s Cross St Pancras, where ticket offices are already extremely busy. Have you ever been to a commuter rail station in the morning at the start of the week, month or year? They’re full of people spending hundreds or thousands of pounds on rail tickets. Ticket machines breakdown and go out of order. Last week, the only ticket machine I could use on a Sunday wasn’t accepting credit cards. I had to walk away. Just to be clear how massive the imapact of this is going to be, I dug into the Office of Rail Regulation’s station usage stats. Cumulatively, these stations deal with over 191m entries and exits a year. 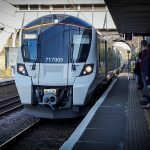 They account for 7% of the entire UK rail network! Below I’ve posted all the stations under threat and the entries and exits they’ve recorded in the last two years. I’ve noted the change in usage of these stations too, because there is significant year on year growth – 4.7% across all of these stations. My local station, Gordon Hill, has seen 8.7% growth in just a single year, with 1.3m entries and exits. It won’t have a ticket office. Stevenage has 4.6m entries and exits and year. It’ll only have a ticket office open between 0600 and 1100 Mon-Fri (NB There is a small Virgin Trains office too). Hitchin has over 3m entries and exits a year and will have similarly curtailed facilities. This is a dismal state of affairs, and it feels like Govia Thameslink Railway is really trying it on to see what they can get away with. This is the rail operator that does not have enough drivers to sustain its service. While it’s training more drivers, it does not offer 7-day a week contracts, which means that all Sunday shifts are voluntery overtime. Before Christmas, Sundays were a disaster as drivers simply chose not to work, leading to entire services being shut down, including the day they launched a new timetable and redirected services to Moorgate at weekends. Elsewhere on the network, they’re trying to implement a smartcard system called The Key, so far with very poor results. They are currently installing barriers in stations, which should stop some of the rampant fare avoidance (you never get checked for tickets except at weekends), but will lead to queues to get out of stations in particular, as hundreds of passengers try to get through a maximum of two barriers. This is a disaster waiting to happen, and it’s going to happen very very soon. Respond now to the consultation by Sunday 13 March. Support the RMT’s stance. Ensure that rail travellers can get the best deals! Station hosts will be available from first train to last train at the weekends too. It says so on that poster. Things have changed, people use Oyster cards and contactless now. If they don’t the host will be able to help. And having someone on the gate all the time will mean less fare evasion in the evenings which will help tackle antisocial behaviour and vandalism on the trains at night. Yes – there will be staffing at the stations from start to finish. Mostly because someone will have to be by the barriers which are being installed in many of these stations. Oyster and contactless is fine as far as it goes, but rail-only travel, or tickets further afield are paper. And all the essential things that the station can do will be removed. 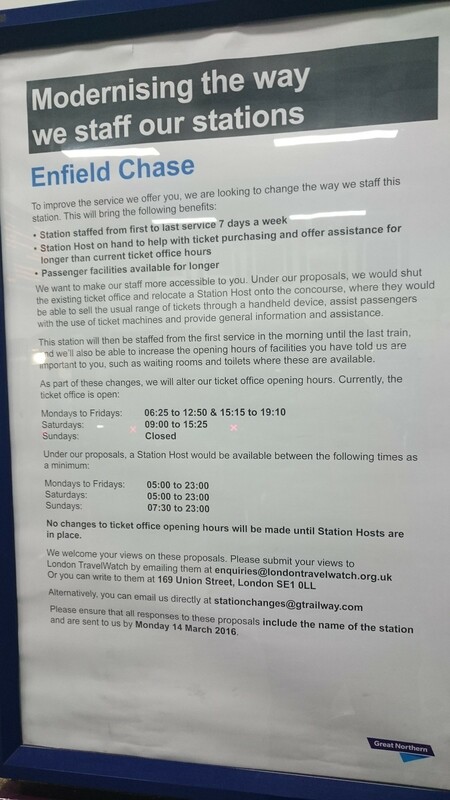 If they want to man the station fully while keeping the ticket office open, that’s fine. But rail stations are not the same as underground stations. Passengers are losing a valuable service. I was at Streatham hill station in Saturday. There was a manned ticket office there but there was no one on the gates. 3 drunk teenagers walked straight through and caused havoc on the train. I was waiting for someone for half an hour no one used the ticket office once. I would have much preferred a host in the hall manning the gates than someone drinking tea behind glass. The police should of been called by the person waiting for an hour or tell the ticket office who would o contacted btp immediately or even 999.